Scooters were getting very popular, at least overseas, with adults as well as children. I was intrigued, but it seemed that they were mostly designed for children, or at least rather small adults, and I'm neither. I need something more Yeti-sized. Maybe I should get a longboard instead? The last time I had been on a skateboard was back during Ronald Reagan's first year in the White House. Greece was about to enter the European Community, the first DeLorean DMC-12 was rolling off the assembly line, the first U.S. Space Shuttle launched, and MTV went on the air. I'm not the typical skating demographic. But as the helpful guy at the local skate shop pointed out, it's pretty much like riding a bike. Except that you have twice as many wheels, of much smaller diameter but greater width, and you stand on a plank instead of sitting on a metal frame, plus a few other minor differences. But conceptually, yeah, it should be something you could pick up again. 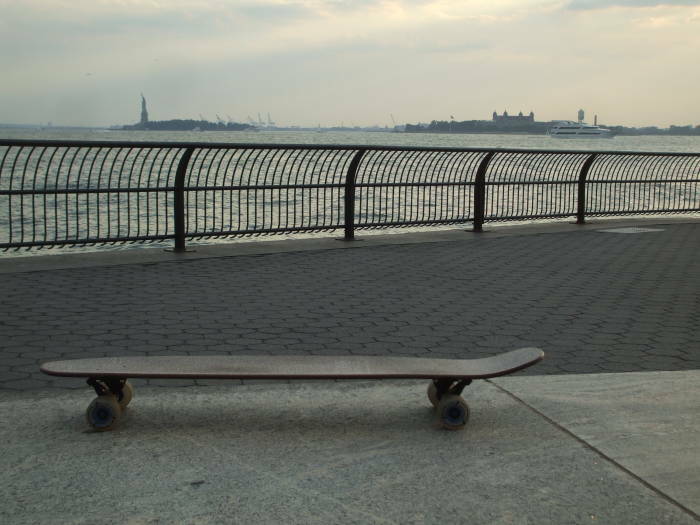 A longboard would be the thing for me. A long wheel base, large deck, made for cruising along largely straight paths. No extra-tight turns, jumps and tricks for me. They didn't have much in stock at the local shop, but promised that they could get anything from their supplier overnight as long as you put in the order by early afternoon. After some research at their supplier's web site and elsewhere on line, I went back a couple of days later. And then again a day or two after that. Unfortunately, I never found the helpful guy again, just some employees who said they didn't keep any in stock, I would have to look on line, and maybe they would get some longboards in stock several months in the future. The good folks at Boards on Nord set me up with a great longboard. It's a Gravity deck, 45" long by 9" wide spoon nose shape. I wanted the full-sized deck for both strength and stability. This deck has the Stone Brewing logo on the bottom, as I was intrigued with its deck surface coating made from crushed glass from recycled bottles. Super grippy! Way better than the usual black sandpaper. Randal 180mm trucks with Rush Abec 5 bearings and Sector 9 70mm wheels on a 30.5" wheelbase. Boards on Nord is super helpful! The specific wheels I had asked for were out of stock. They called me the next morning and helped me pick a replacement. It was assembled that morning, shipped that afternoon, and reached me a few days later. 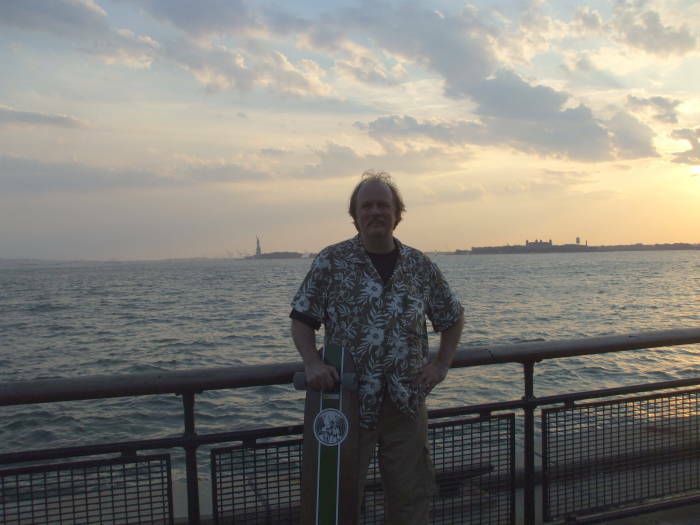 After a few weeks of messing around on the longboard around the Purdue campus, I had a job teaching a one-week Linux course in New York. Time to take the board along! Delta Airlines will grudgingly transport a skateboard. I had slipped both my longboard and my backpack into large laundry bags to lessen the damage caused by the baggage systems. The woman at the Delta counter asked me what my bags were, sighed, and pulled out a couple of slips and demanded that I sign them. Knowing what was going on, I asked anyway. She said: "This is your acknowledgement that we aren't responsible for any damage or loss." "I was hoping that you would get my bags to the other end without damaging or losing them." She snarled, "Look, we aren't responsible for any damage or loss anyway. We just have you sign this as a courtesy to you." Really, Delta? That's what you think the word "courtesy" means? Unpleasantly forcing me to acknowledge in writing that you are about to damage or lose my possessions? NYC Bike Maps has the information you need. They have several maps showing dedicated bike paths as well as bike lanes within the city. 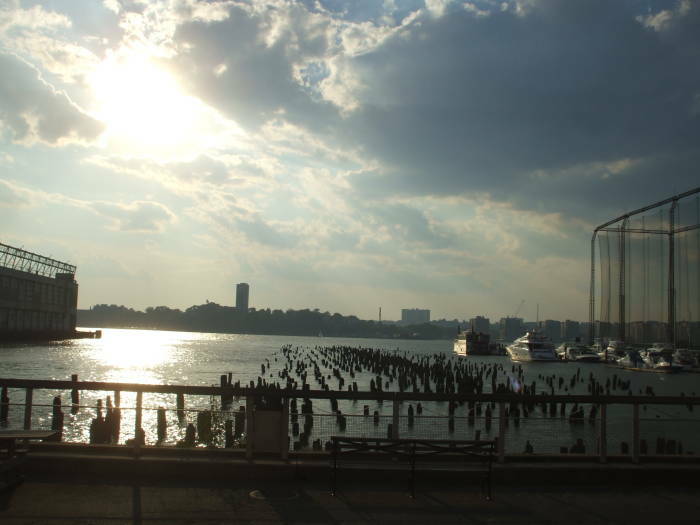 We are looking to travel from the Broadway Bridge joining the northern tip of Manhattan to the Marble Hill area of the Bronx, down to the Battery and Staten Island Ferry terminal at the southern tip. 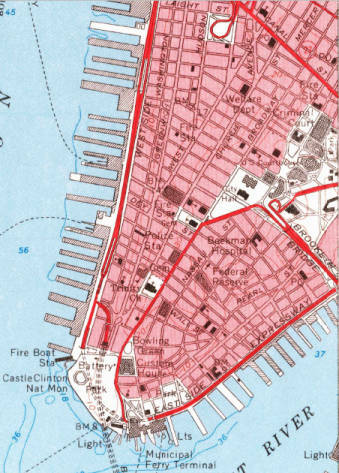 The obvious choices are to take Broadway the entire length of the island, or follow the Harlem River and East River down the east shore, or follow the Hudson River down the west shore. The problem with the all-Broadway route is the hilliness. 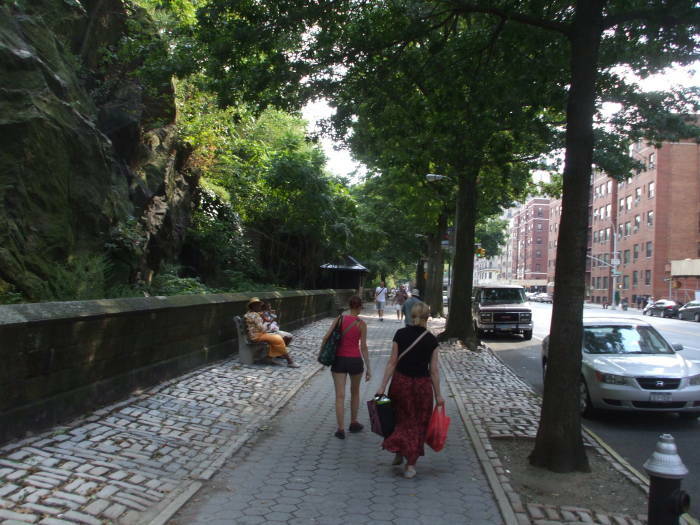 Just consider the names of some of the landmarks and neighborhoods along the way — Inwood Hill Park, Washington Heights, Morningside Heights, and so on. I'm not comfortable with much of a downhill slope, and pumping uphill is tiring. I've walked the length of Broadway in a day, and didn't care to repeat much of that while carrying a longboard. I started by taking the #1 train north the entire length of Manhattan. 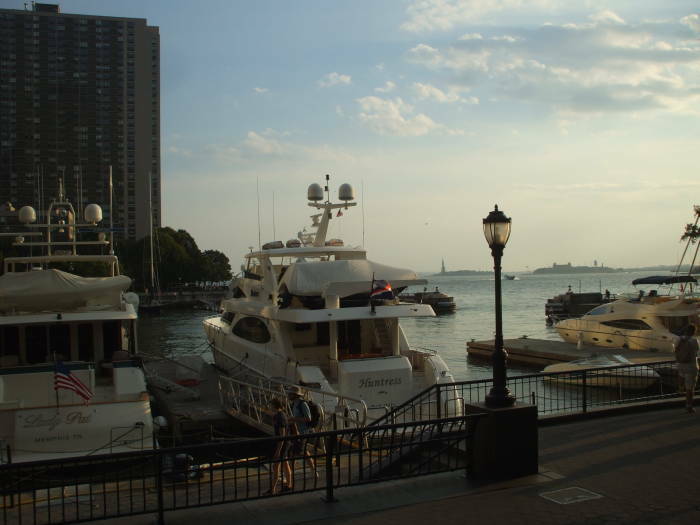 I was staying in a corporate apartment in the Financial District, as I would be teaching at #1 New York Plaza next to the Staten Island Ferry Terminal. 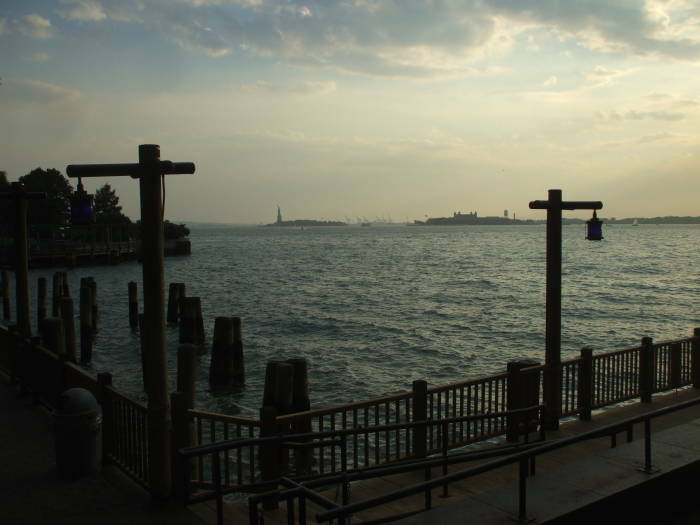 The south end of the #1 line is South Ferry, below the Staten Island Ferry terminal. 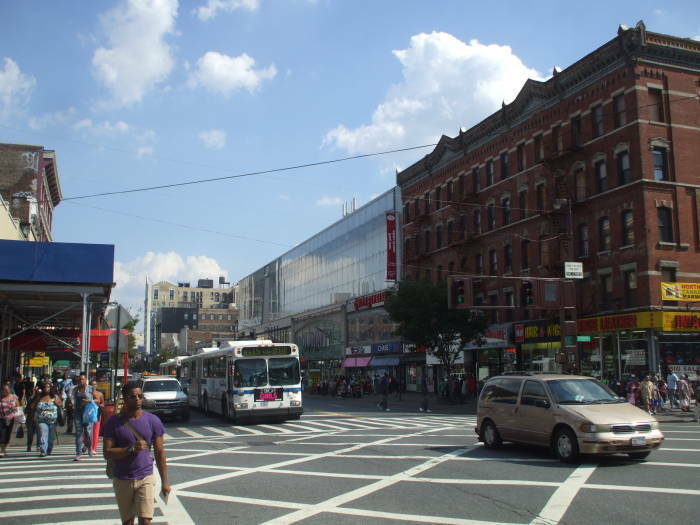 From there, it's a ride of close to an hour through 33 stops to 225th Street, the first station in the Bronx. 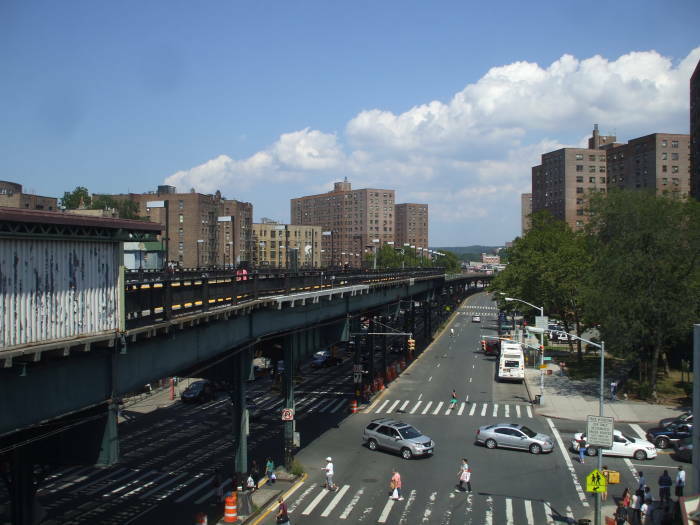 The #1 line is elevated in far northern Manhattan and into the Bronx. 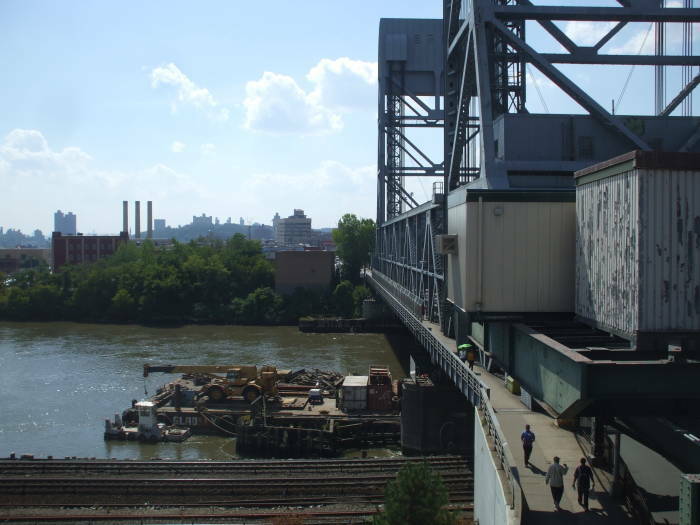 The train crosses the Harlem River on the Broadway Bridge, which is two lanes of road traffic in each direction at ground level and two elevated rail lines above, all crossing a vertical lift bridge. Above we're starting down the stairs from the 225th Street station, looking on toward the north as the #1 line continues into the Bronx. 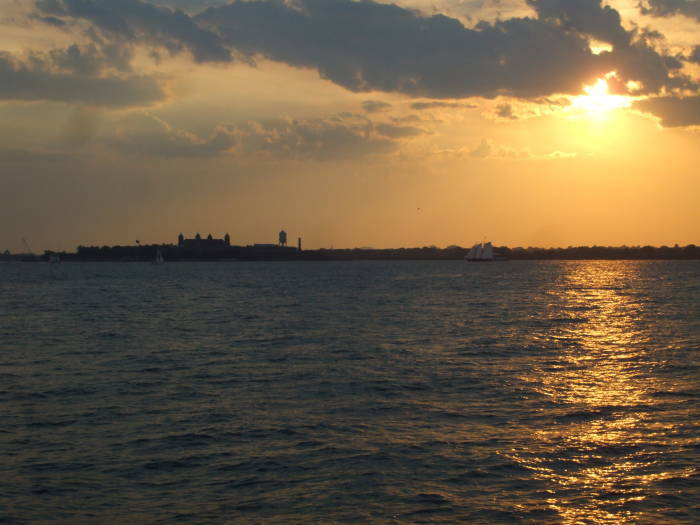 Then we're looking the other way, south into Manhattan. I will start by crossing this bridge on the walkway where we see the pedestrians. A guy is asking me if I would like him to take my picture, he saw me setting the timer. He and his boy were impressed with my plan, although I just described it as seeing how far south I could get. Watch out for the hubris. The Broadway Bridge walkway surface is pretty smooth. It's a steel grid with concrete poured into it. 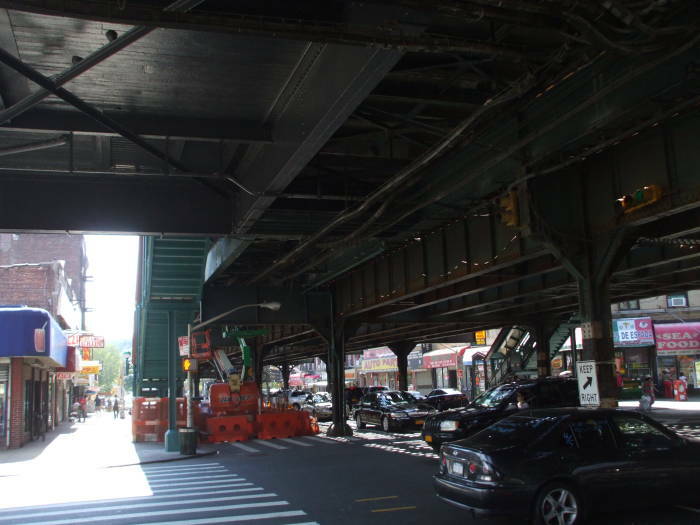 Once off the bridge, it's three blocks south on Broadway under the #1 train. After those first three blocks, I will bear to the left to continue under the #1 line, leaving Broadway for 10th Avenue at 216th Street. 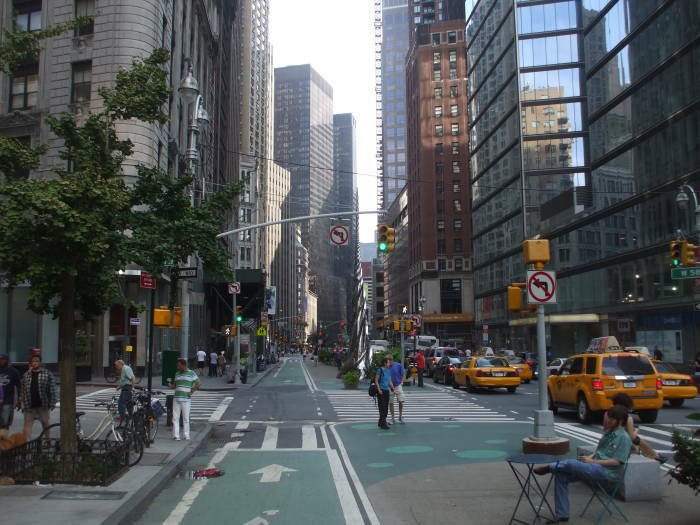 I will re-join Broadway some 157 blocks south, at Columbus Circle. Here is the path so far. South across the bridge and along Broadway, in red. Then turning onto 10th Avenue and continuing under the #1 line where you see "3 TRACKS TRANSIT". That turn is about Mile 0.5. A large MTA maintenance yard is between the avenue and the river, making for long stretch of sidewalk without any cross streets. That's nice, kind of a warm-up. Some of the curb cuts are rideable, many are very rough. 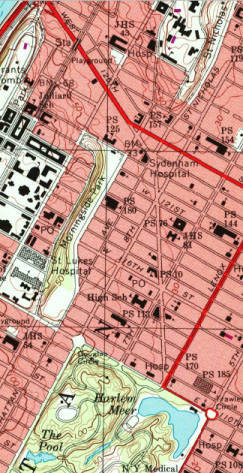 207th Street is a major street at the south end of the MTA yard. It turns into Emerson Street to its west and crosses the University Heights Bridge to the east. Crossing 207th was Mile 1.0. Then it was on south along 10th Avenue past one of the N.Y.U. campuses (campi?) 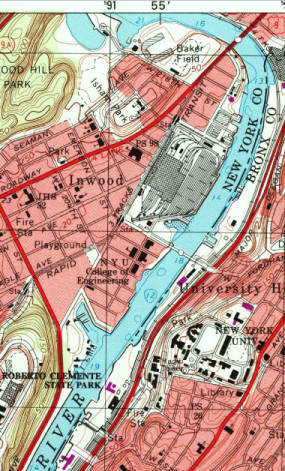 to the intersection with Dyckman Street, which turns into the Harlem River Drive. 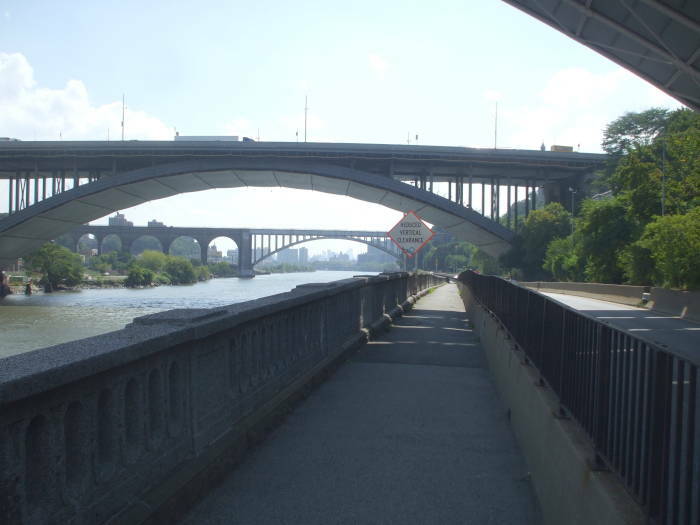 Below is the north end of the Harlem River Drive bike path, starting at Roberto Clemente State Park. This is Mile 1.5. Those cars are coming off the north end of the Harlem River Drive, if they continue straight they will be on Dyckman Street. 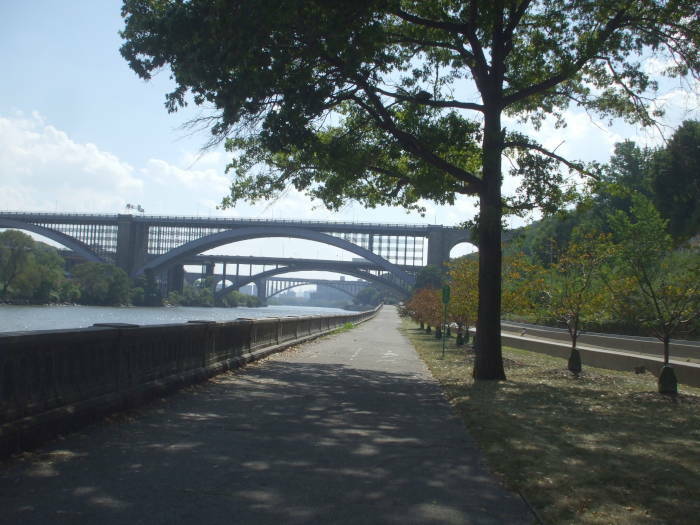 I will continue south on the bike path under the three bridges of the Washington Bridge, the I-95 bridge, and the High Bridge. 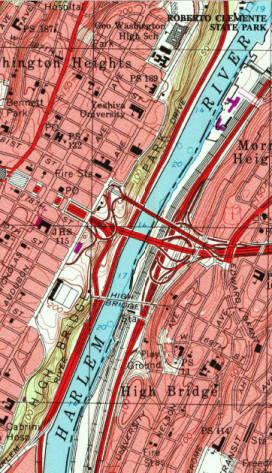 The Harlem River Drive bike path leaves the river around 163rd-164th Streets, just to the left of the "H" in "HARLEM" in the map above. 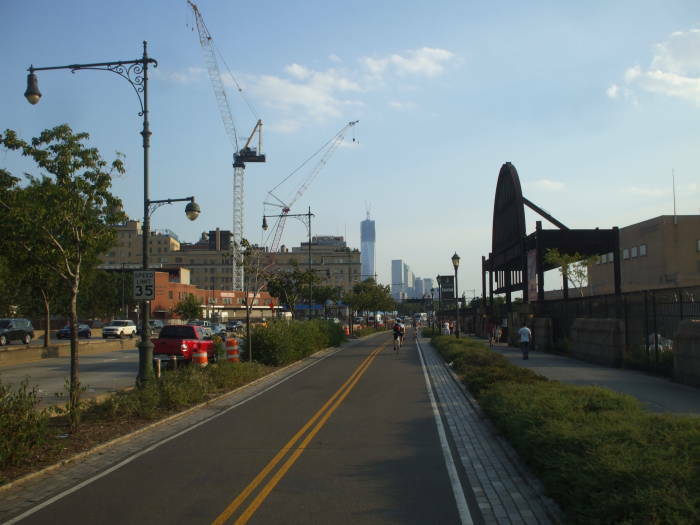 The bike path is broad in the north half, with varying quality of pavement. It's very nice at the north end, getting rough for a while through the middle then smoothing back out. Here I'm around Mile 2.0. Here come those three bridges. 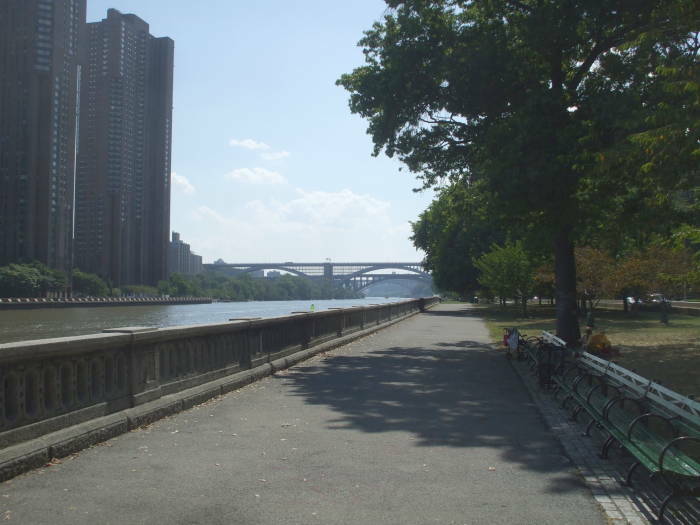 The Harlem River Drive and the bike path are on a narrow shore below the high ridge of Washington Heights. The path narrows as it goes under the Washington Bridge and the I-95 bridge. Mile 2.5 is a little south of the I-95 bridge. The nice wide and level riverside bike path comes to an end a little past Mile 3.0. The path used to continue south from here, but now it's blocked off and overgrown. 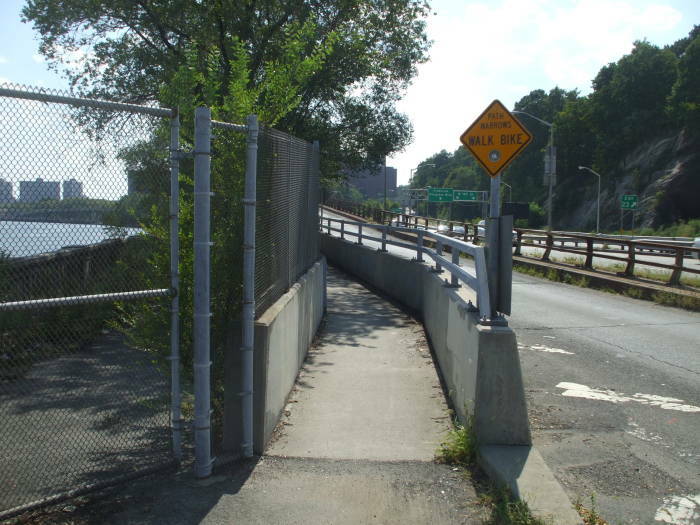 Here, about even with 163rd Street, you have to go up this narrow walkway beside the highway ramp. 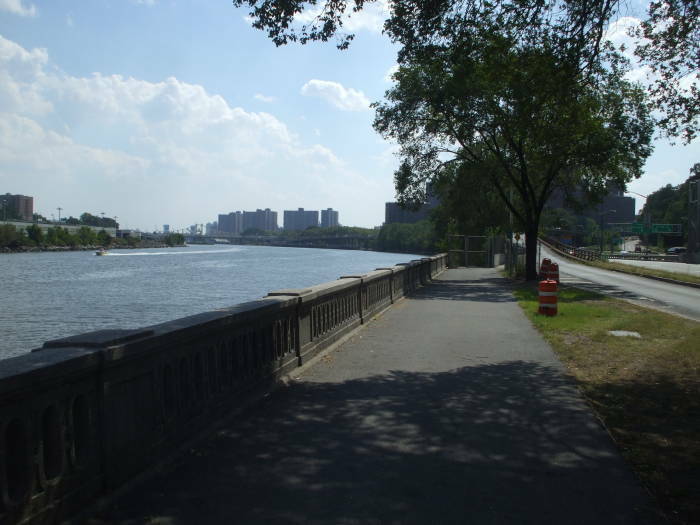 The bike path continues south along the southwest branch of the Harlem River Drive which will join into Saint Nicholas Avenue. 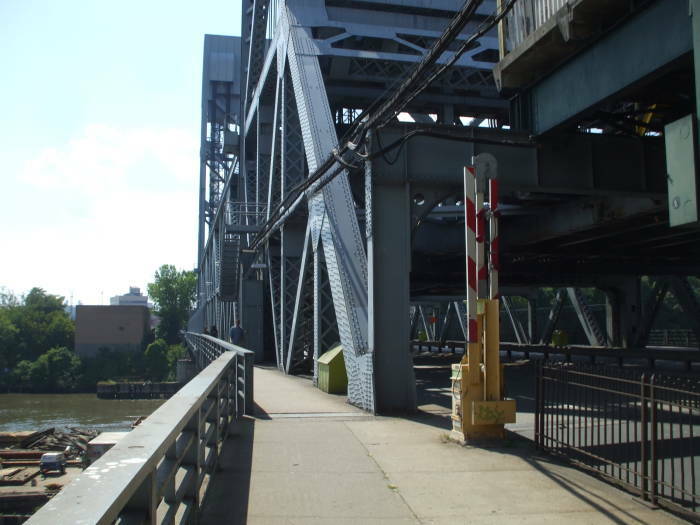 But instead of continuing to climb on up along the bike path, I looped back down to a small street paralleling the riverside branch of the Harlem River Drive. 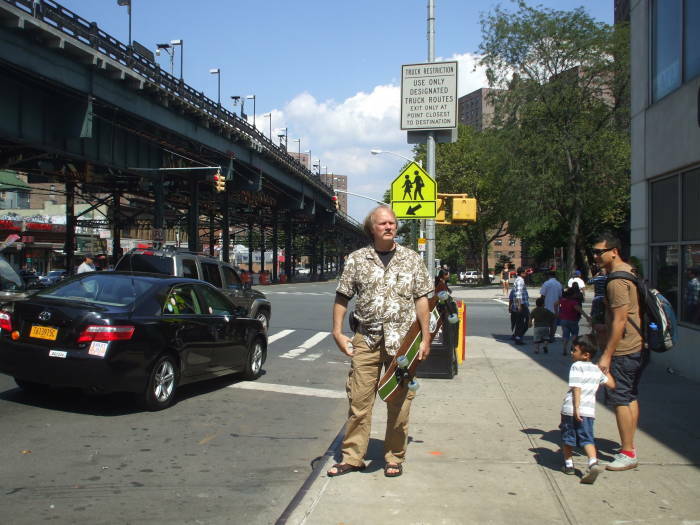 After a few blocks I could turn right onto Frederick Douglass Boulevard, around 159th Street. Mile 3.5 was the north end of Frederick Douglass Boulevard at 159th Street. 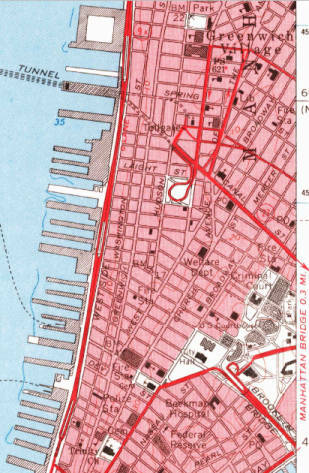 I went south, crossing the major 155th Street, then turned right on 153rd Street for one block to Jackie Robinson Park (marked on this older map as Colonial Park). Here, about one-quarter of the way into the ride, I turned south on the sidewalk along the park beside Bradhurst Avenue as seen below. It was a hot Saturday, about 90°F, and a lot of people were out in the shady park. Mile 4.0 was around 151st Street. 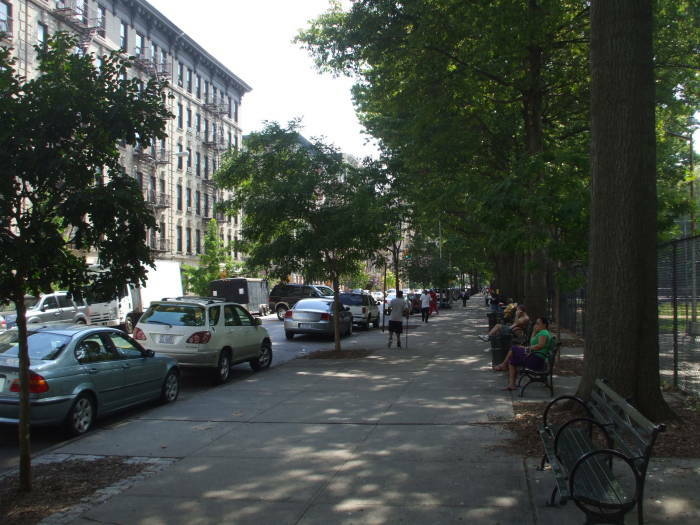 At the south end of this park, around 145th Street, there was some up-and-down for a few blocks. Then things smoothed out as Bradhurst Avenue and Edgecombe Avenue joined and continued south. 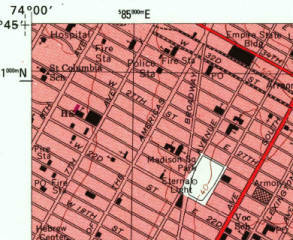 Bradhurst / Edgecombe merged into Saint Nicholas Avenue around Mile 4.5 around 140th Street. 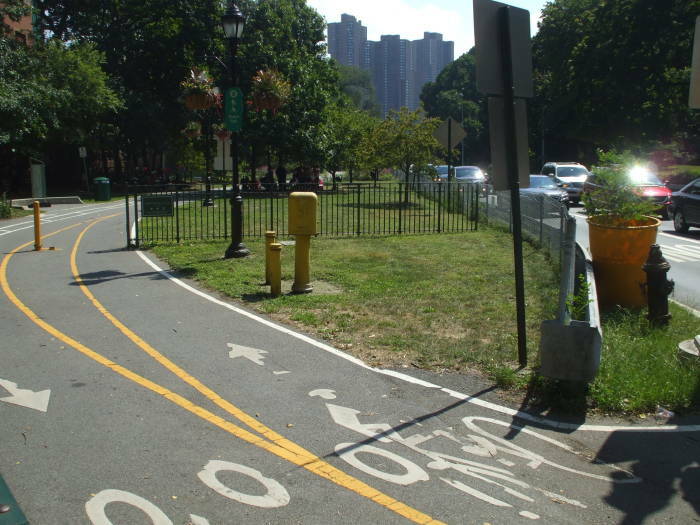 It was still a nice ride, a very smooth sidewalk with just a few people walking along the edge of Saint Nicholas Park. Several people were relaxing in that park, too. 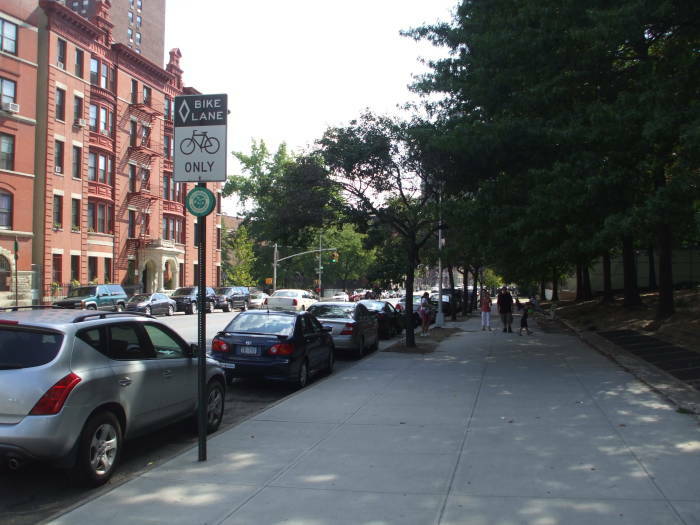 Mile 5.0 was at 131st Street, still four blocks north of the south end of Saint Nicholas Park. 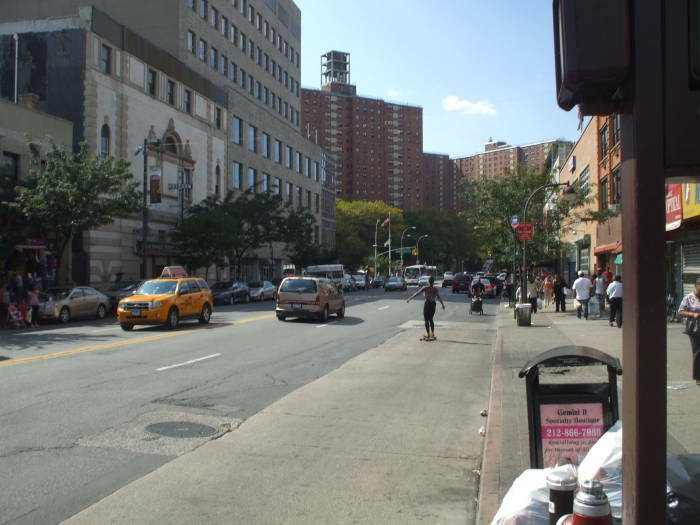 125th Street is the heart of Harlem. In the first picture we're looking east on 125th, here comes an M60 bus from LaGuardia Airport to the Upper West Side. Below we see another longboarder headed west on 125th. Saint Nicholas Avenue angles slightly to the left (southeast) just south of 125th. I stopped there about 20 minutes, drinking a bottle of Gatorade while sitting on the steps next to the bodega. Around 122nd Street and Mile 5.5 Saint Nicholas Avenue crosses Frederick Douglass Boulevard, where I turned slightly to the right toward the northwest corner of Central Park. 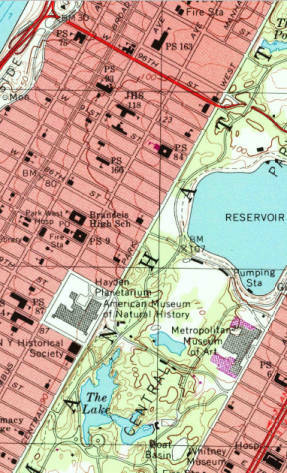 Here is that northwest corner of Central Park, where Frederick Douglass Boulevard becomes Central Park West as it continues south, and where Central Park North (or 110th Street) becomes Cathedral Parkway. I entered the park for a little way, but it was a little too hilly for me in this area. Lots of people were walking, jogging, and biking, and there were a number of skateboarders more grade-tolerant than me. I returned to the sidewalk, but here along the northernmost 15 blocks the surface was rather undulating in places. 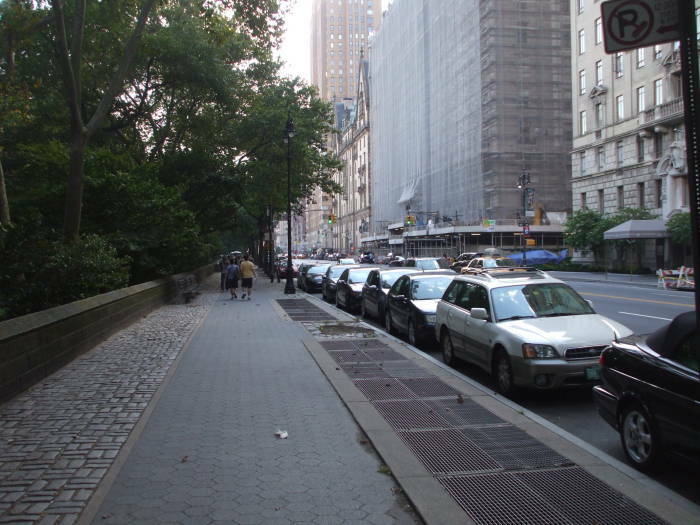 Plus, only 50% or less of the sidewalk on the park side was the smooth hexagonal paving stones. Above, I am around Mile 6.5 near 102nd Street. At 97th Street I turned back into the park. 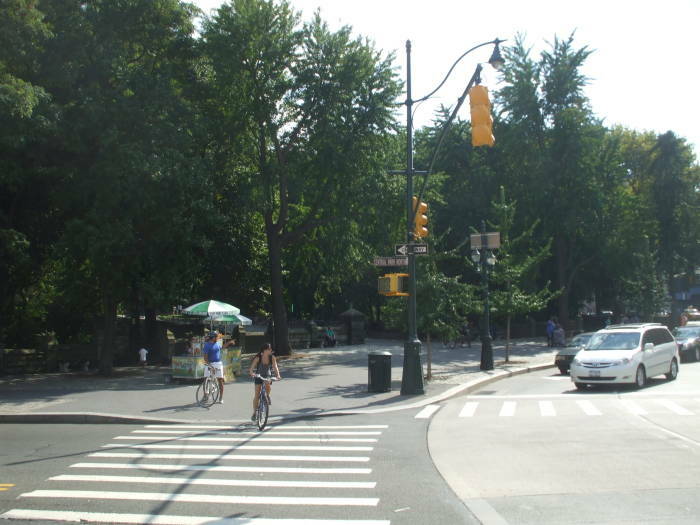 Most of the cross streets and the roads within Central Park are closed to motor vehicles on the weekend. I turned south around Mile 7.0 and soon passed The Reservoir. 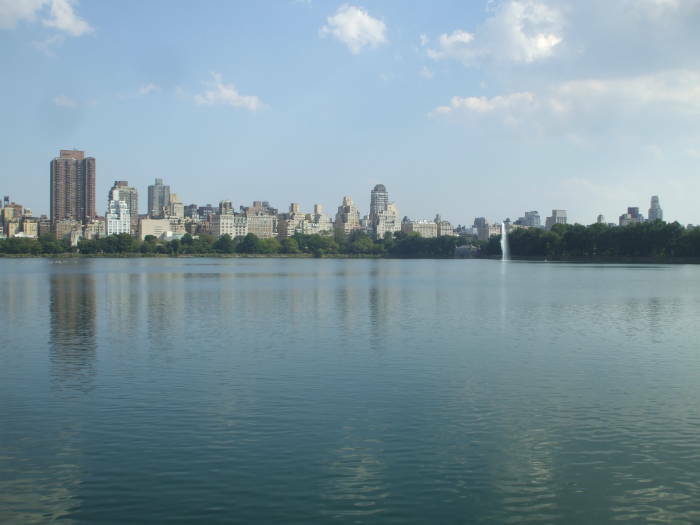 I returned to the Central Park West sidewalk around 88th Street and Mile 7.5, almost half way. The surface was better for riding, and I seemed to have gotten my second wind. That's good, because this was the half-way point. Mile 8.0 came at 78th Street at the American Museum of Natural History, and Mile 8.5 was at 68th Street. 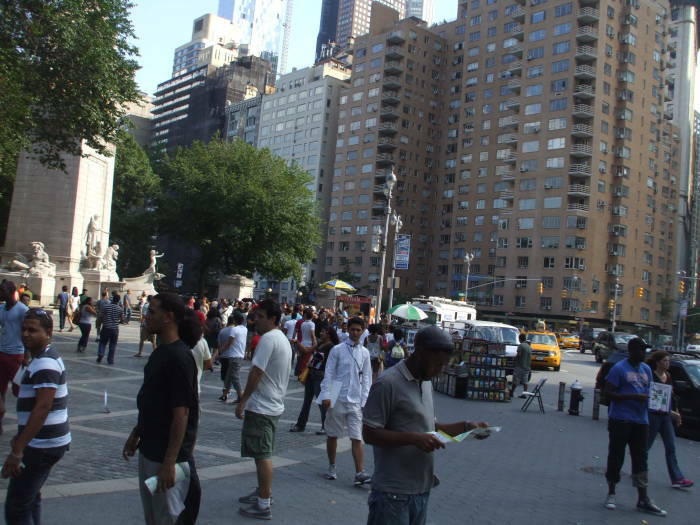 Columbus Circle is where Central Park South or 59th Street crosses both Central Park West or 8th Avenue and the slightly angled Broadway. 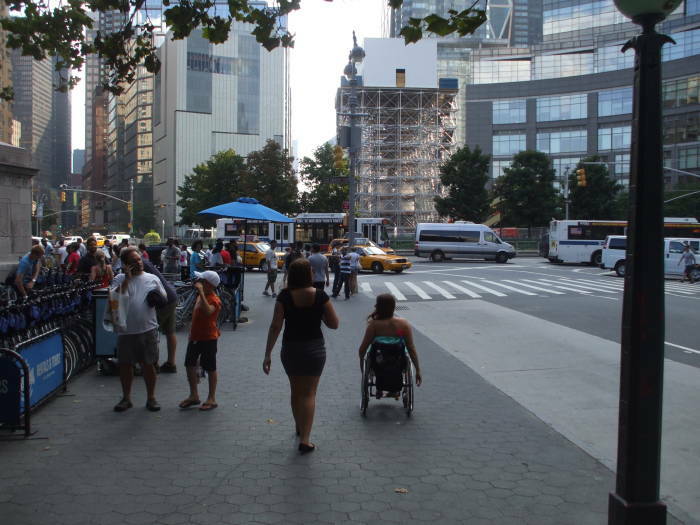 Columbus Circle was crowded and busy, but then it immediately became less crowded as I started south on Broadway. 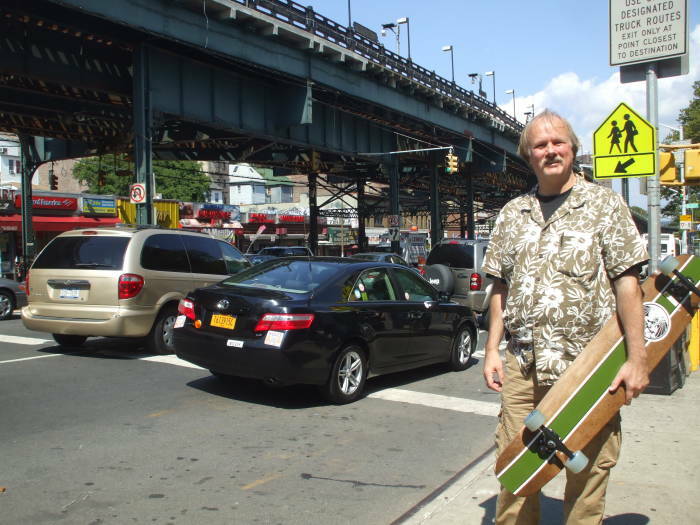 Below you see my board ready to roll south off Columbus Circle and into Mile 9.0. A very nice thing about Broadway through Midtown is that they have moved much of the traffic off of it, in fact all of the traffic through Times Square which is now pedestrian-only along Broadway. 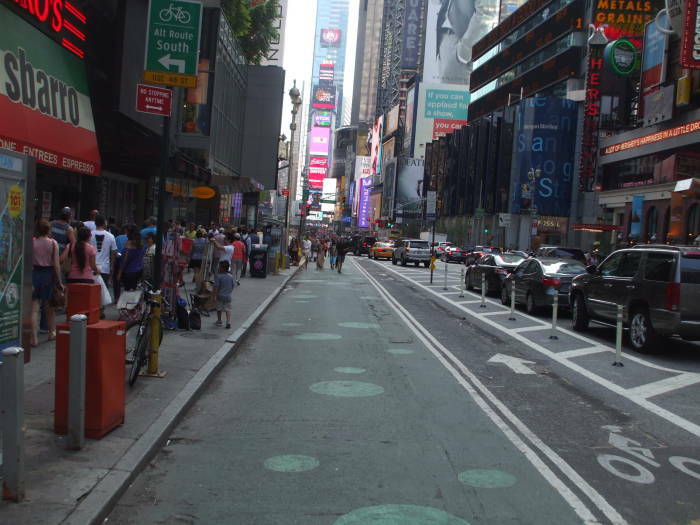 There is a vehicle-free zone within the Broadway street surface, between the curbs, partly two lanes marked for bikes plus a "greenway" area painted green with tables and chairs spaced around. I briefly catch up to another skater at 54th Street, just before passing the Ed Sullivan Theatre. He will leave me behind. He is fast, with a helmet and gloves. I am persistent. The Yeti rumbles on southward. I am getting close to the point where I am going to have to walk. I can easily roll on through 49th Street and Mile 9.5 at the next intersection, but then I will have to stop at 48th Street. 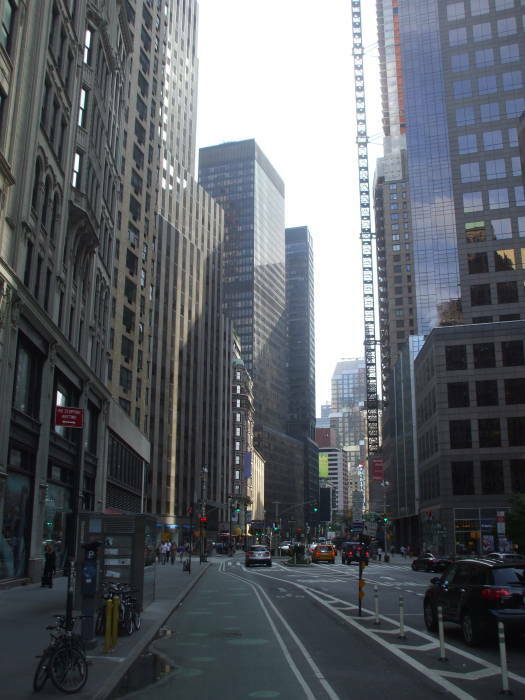 Here begins the entirely pedestrian zone along Broadway from 48th Street down to 42nd Street. 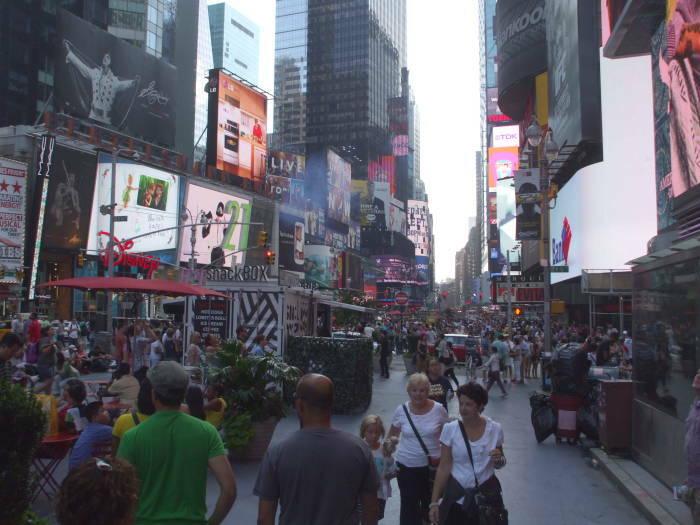 This picture actually shows a far less crowded area within the madness that is Times Square late on a hot afternoon. Not only is it incredibly crowded, but most people are quite literally wandering aimlessly, randomly turning, stopping, backing up. It's hard to just walk through here. Plus there are all the people in full-body mascot-type costumes promoting various Disney, Sesame Street, Smurf and other outlets. And, all the people who have come here in what appear to be adult-sized children's Halloween costumes, on the off chance that some tourist wants to pay them to take a picture with them. Only some of the costumed people are intoxicated or insane. Well, actually, many of them. But not every last one. 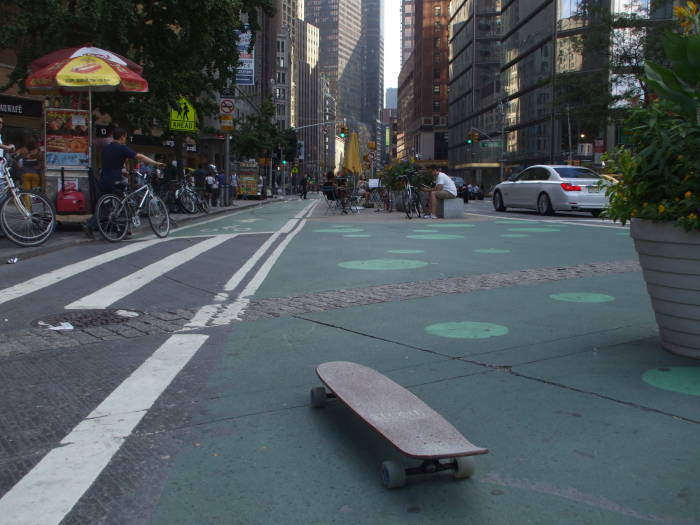 Once I got down to 41st Street I could put the board back down and start riding slowly, weaving through the rapidly decreasing density of wandering tourists, and by 40th Street the going was pretty good again. 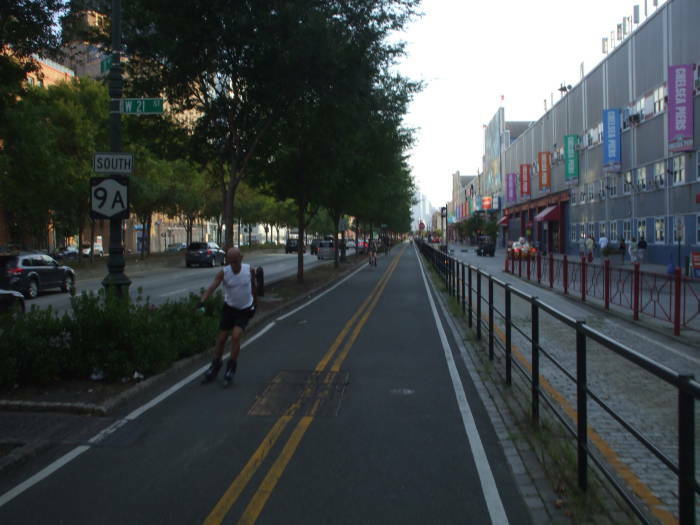 It was a two-lane bike path down the left (east) side of Broadway, with some green space and tables and chairs. Then it was a mob scene at Broadway and 34th Street. Slowly pick your way across 34th and then across the nearly parallel Broadway and 6th Avenue, and then it was just a bike lane south from there. 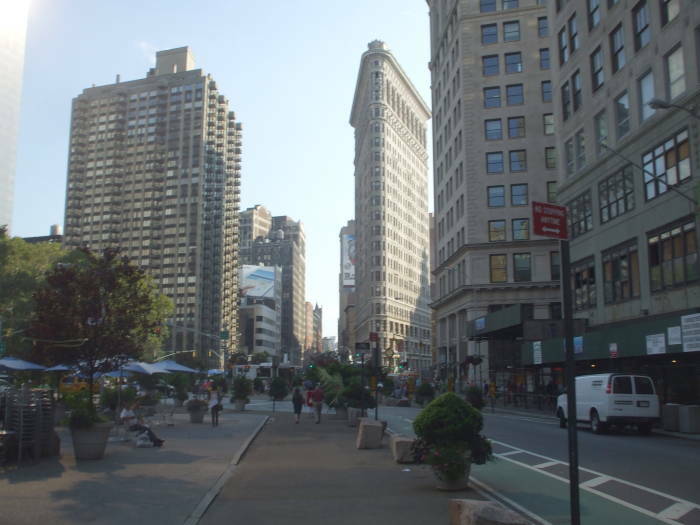 That brought me down along the side of Madison Square Park and to 23rd Street, where Broadway continues south past the Flatiron Building as it crosses 5th Avenue at the very shallow angle shown by the Flatiron's shape. However, I turned right at this intersection of Broadway, 5th Avenue and 23rd Street. I went west on 23rd Street. Good, wide sidewalks, room to weave around the distracted pedestrians. 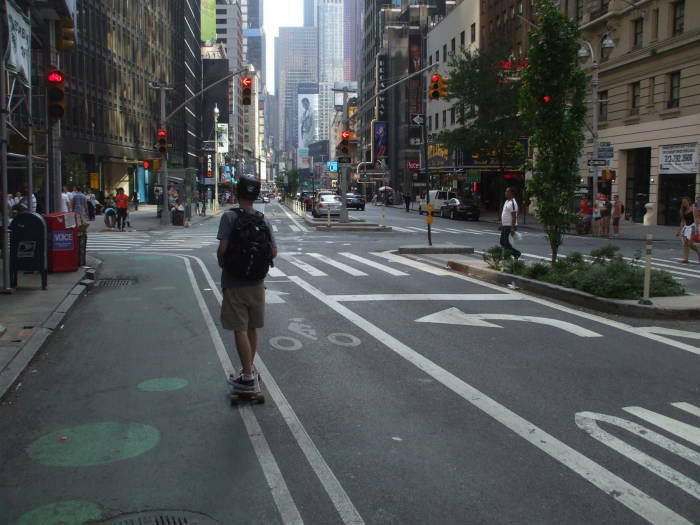 For whatever reason, this stretch had the most distracted pedestrians outside of Times Square. Plus the husband and wife sharing an electric scooter chair, and the woman talking on her cellphone while pretty randomly propelling her wheelchair with the other hand. I went to the Half King on 23rd just west of 10th Avenue and almost beneath the High Line. Sat at the bar, had one of their draft beers and two larger glasses of water. It felt good to sit there for 30 minutes, but I really stiffened up and started getting sore. 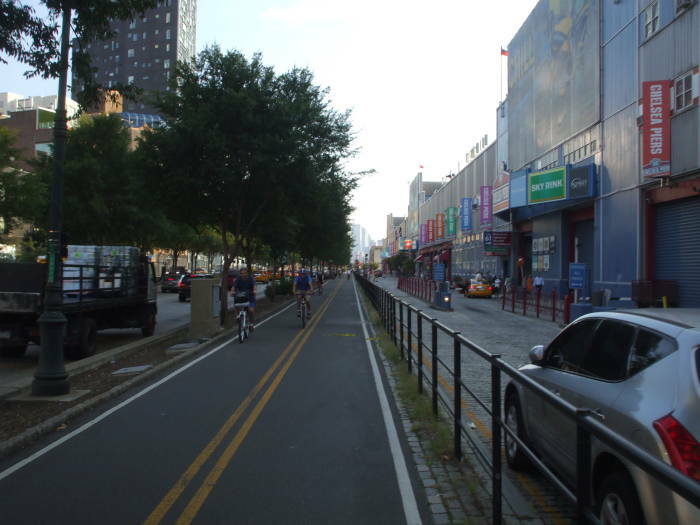 It was very easy rolling the rest of the way down 23rd Street to West Street, then across that to the north corner of Chelsea Piers and the Hudson River bike path. But then it suddenly got hard, like I was going slightly uphill and into the wind. Maybe there was a little headwind, but sitting for 30 minutes had really stiffened me up. 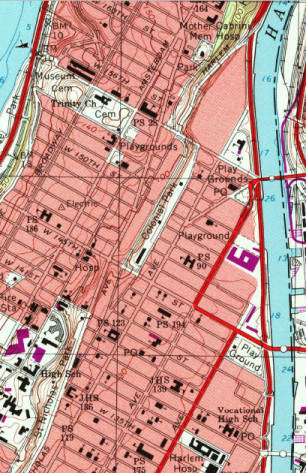 The map shows a Penn Central rail line just a block or so in from the Hudson River shore. That's now the elevated High Line park extending from Gansevoort Street in the West Village up to about 30th Street. Lots of other people were out on the path. I was passing the people who were walking and that was about it. I was doing what I could to boost self-esteem among joggers. This was about three-quarters of the way through the trip. Here I'm looking over a ruined former pier and across the Hudson River to either southern Hoboken or northern Jersey City. As I pass the lower end of the Meatpacking District the towers of the Financial District loom in the distance. Mile 12.5 around 13th Street. Mile 13.0 around Perry Street. Mile 13.5 around Prince Street. Mile 14.0 around Franklin Street. Then there was some required detouring around construction around the World Financial Center at Mile 14.5, out to the waterline and down around North Cove and on south around Battery Park City at Mile 15.0 and its yacht basin, where both Ellis Island and the Statue of Liberty became visible ahead. The map above is from the 1960s and the waterline has really changed since then! No more piers all the way down, and there has been a lot of construction on filled-in land. Getting close, keep on going. 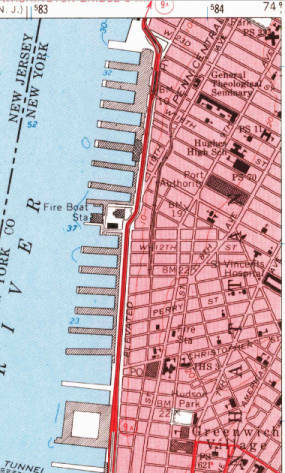 There's the South cove, seen here, and then the Jewish Heritage Museum, and then Battery Park is just around the point. Mile 15.5 at Battery Park looking across the harbor to the Statue of Liberty and Ellis Island with the Port of New Jersey visible beyond them.